Advancing Ideas has released the Hypnotic Language Mastery Pack – designed to get you up to speed on all the most powerful and effective NLP and hypnotic language patterns. The Hypnotic Language Mastery Pack is a step-by-step instructional program teaching hypnotists, hypnotherapists, NLP Practitioners and those who simply wish to dramatically improve their communications skills, the best of NLP and hypnotic language. 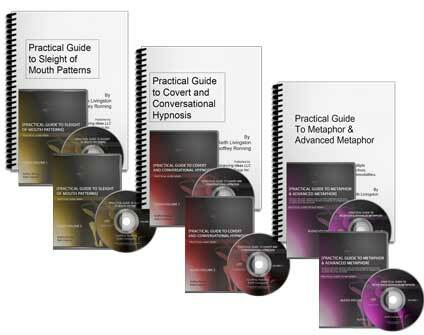 The pack includes the Practical Guide to Covert & Conversational Hypnosis (the Milton Model), the Practical Guide to Sleight of Mouth AND the Practical Guide to Metaphor and Advanced Metaphor. “In my experience, this is the one and only package to combine all of the most critical NLP skills in three powerful and concise lesson plans. The audio portions allow me to listen time after time after time – so I absorb the material deeper and deeper as I listen to them again and again. Thank you Keith!